Years of understanding of this domain, has helped us in presenting patrons with the optimum quality of Digital ECG Machine. Used for tracking of heart rate, heart rhythm and coronary artery diseases, the digital ECG machine is known for its simultaneous 12 lead acquisition and Built in rechargeable Ni-MH battery. Owing to its Built in RS 232 interface, the digital ECG machine is used in tracking of abnormally thickening of heart muscle. 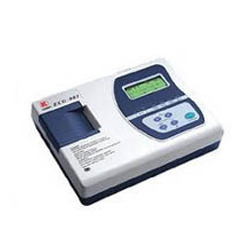 We offer ECG Machine with 901 model from which graphic is produced by an electrocardiograph. This records the electrical activity of the heart over time. The machine works when electrical waves cause the heart muscle to pump. These waves pass through the body and can be measured at electrical contacts attached to the skin. Matching up the ever-changing needs of the patrons, we provide patrons with the superior quality of 6 Channel ECG Machine. For the purpose of tracking coronary artery diseases and abnormally thickening of heart muscle, the 6 channel ECG machine is used in hospitals and nursing homes. The 6 channel ECG machine is provided with 7 inches TFT touch screen and LED backlight. Abnormally thickening of heart muscle. 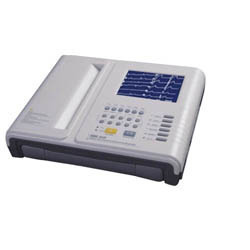 Modern infrastructure has helped us in presenting patrons with the superior grade of 12 Channel ECG Machine. The 12 channel ECG machine is known for its simultaneous acquisition of 12-lead ECG data and graphic display of 12-lead ECG waveform. In addition to this, the 12 channel ECG machine is appreciated as screening tool for a wide range of cardiac abnormalities. 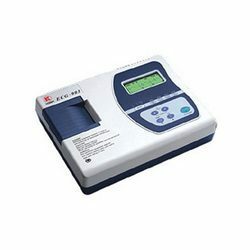 Being a market leader of this domain, we provide patrons with the superior quality of 1 Channel ECG Machine. Equipped with High-resolution thermal printing array system, the offered one channel ECG machine is used for screening of different cardiac abnormalities. 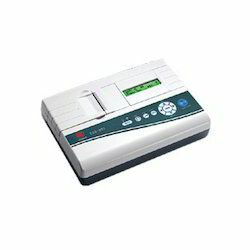 Manufactured by using latest machinery, the one channel ECG machine is known for its frequency response as high as 150 Hz. Capable of printing continuously on channel trace and annotations including lead mark and parameter such as sensitivity, paper speed and filter operation status.